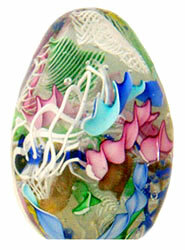 Murano Glass Egg Paperweight made with pastel colored filigree cane. 3 inches tall by 2 inches wide and weighing approximately 10 ounces. Because they are handmade, no two are ever alike. Handcrafted glass from Murano, Italy.